Using marble stone as part of your building project will most likely be one of the best investments a building contractor can make. Using any type of stone is going to be costly, but the return on investment cannot be denied. More builders are understanding this concept. No matter how large or small a contracting company is, it can be said that it’s almost forced to incorporate marble into a building project in one way or another due to the increasing demand of such a product. It used to be building with stone was a thing of the past. Of course, there are some exceptions. Depending on the proximity like the south where strong windstorms are most likely to happen, stone was and still is used as a structural building material. As people began to mine more and more, the discovery of different types of marble were unveiled. At this point, marble’s aesthetic attributes revived itself. As it had been popular in the eastern part of the world for art—statues and buildings used to distinguish one class from the other, so it has become this way again in today’s society. It can be said that marble is indirectly associated with wealth, correlating to the higher class of a population, which can be loosely associated with success. Consequently, most of any type of representation that is associated with success might be coveted and marble is no different. The type of marble that most people might be familiar with is the lighter tones as it is often associated with some of Europe’s architecture, as well as a few of Michealango’s famous stone carvings. Some of the preferred stones in particular, are the neutral tones like Crema Bella, Crema River, or Crema Marfil. These three types of marble all have the same color tones: beige, brown, and cream, but differ in shades depending on the veining color in addition to the amount veining throughout the slab. If there is a significant amount of brown veining, the overall look of the slab is going to be a bit darker. Likewise, if the veining is minimal, the tone will be lighter. Oftentimes, this these small differences can make a big impact on the design of a space. For those who require a warmer tone typically go with the Adalia Cappuccino. These are usually the kind of stones that you might find in some of the designs shown on HGTV or even in some of the interior design publications. Most builders and contractors usually buy their building material in bulk. As a result, it only makes sense to buy materials they know will sell easily. Contracting companies are in competition with one another, so the quicker each business can build, the more likely that it will operate successfully. For if a contracting company is even one day late in providing marble tiles, that customer can always go to another contracting company that has a warehouse of tiles on hand ready to go at a moment’s notice. In this case, the customer will gravitate toward the company that has the resources on hand to install. Again, most building contractors have already realized the value in fully stocking their warehouse with the most popular marble titles. So the competition becomes even fiercer. In order to rise above your competitors, consider stocking another kind of marble tile that although may not be the most popular as the primary style, can certainly be used as an accent. A perfect accent tile is Rojo Alicante. 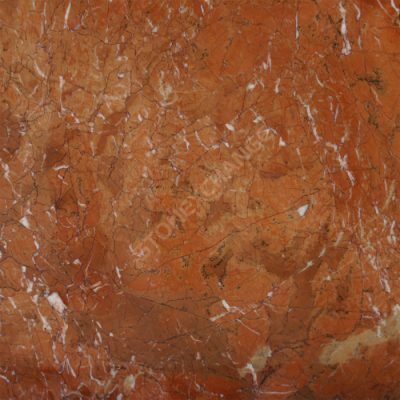 Originating from the Aegean side of west Anatolia Turkey, this striking marble is a maroon-toned natural marble with white and brown veins that, depending on the variation, can often give off a slight rose hue. The surface is polished with a straight edge and is offered in 12” x 12” x 3/8” and 18” x 18” x ½” and starts off at $6.45 per square foot at Nalboor Tiles, an online showroom for builders, contractors, architects, and designers. Accent Wall – Choose a wall within a space that will most likely receive the least amount of attention and install Rojo Alicante in place of paint or wallpaper. Fireplace – A fireplace is often the focal point in any space. Make it pop by installing Rojo Alicante around the hearth. For a bolder approach, install this tile on the interior of the entire chimneystack. In other words, don’t just install Rojo Alicante under the mantle, but over it—all the way up to the ceiling! Wet Bars – Homes and offices can benefit from a mini bistro. Using Rojo Alicante marble tile is a decorative way to distinguish one space from the other. It will also work extremely well as part of the wet bar build. This tile can also be installed as a backsplash. Tile Carpet – Paired with Adalia Cappuccino, Rojo Alicante will make an impressive floor feature for any foyer or living space. The Rojo Alicante could serve as a daring border around the Adalia Cappuccino in a sea of Crema River flooring. This same concept can also be installed as a decorative wall feature. Nalboor Tiles is located in Miami, Florida. We have been supplying building contractors with marble stone for over ten years. We ship orders anywhere in the United States at a moment’s notice without any delays. Our company also carries a myriad of natural and engineered stone along with porcelain tiles and mosaics. To ensure that you are satisfied with your purchase, we also ship out free samples. So if you are interested in stocking Rojo Alicante as part of your building inventory, call us today at 1-305-501-4548 or send us a question through our online form and one of our representatives will contact you as soon as possible.